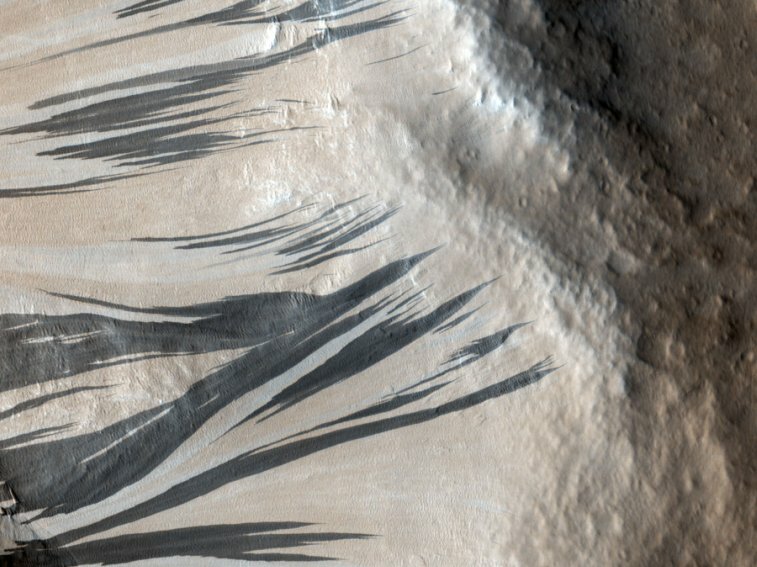 No one knows for sure what creates these picturesque dark streaks on Mars. A leading hypothesis suggests that the streaks are the result of fine-grained sand sliding down the banks of troughs and craters. In this image, dark sand appears to have flowed hundreds of meters down the slopes of Acheron Fossae. The sand flows like a liquid around boulders, and, for some reason, lightens significantly over time. This sand flow process is one of several which can rapidly change the surface of Mars; other processes include dust devils, dust storms and the freezing and melting of areas of ice.